We are all with you in solidarity as you strike today to defend jobs and to defend each other. Stand firm! You have much to be proud of! Not only have members at Queen Margaret University refused to take any threat of staff cuts lying down, you have also smashed the anti-trade union act 2016’s threshold barrier with 72% turnout! May your pickets be massive, fun, and enlightening for all around you! In contrast, Queen Margaret’s senior management should hang their heads in shame. That management prefer to terrorise staff with the threat of the axe rather than to properly explore alternatives with UCU negotiators is a disgrace. The proposed cuts would steal livelihoods and intensify workload pressure on staff who remain in post. Your local strike is all our fight. Nobody strikes lightly, so as you stand together for jobs, for education, and for decency and hope: know that we are with you. TThe university’s lists system doesn’t seem to be sending this email out to our members – so here is our latest email for all to read! 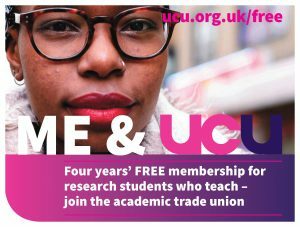 UCU local news: remember to vote; international members survey; improving the adverse weather policy; lots more! 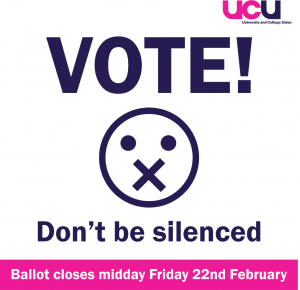 The election for UCU national vice president opens on Friday 1 February. Our fantastic president Vicky Blake is one of the candidates. We’re holding a hustings on 12 February at 12pm. Currently, UCU is running a UK-wide survey ‘Counting the costs of casualisation’. If you’re on an insecure contract, please fill it in and encourage colleagues to do so too. 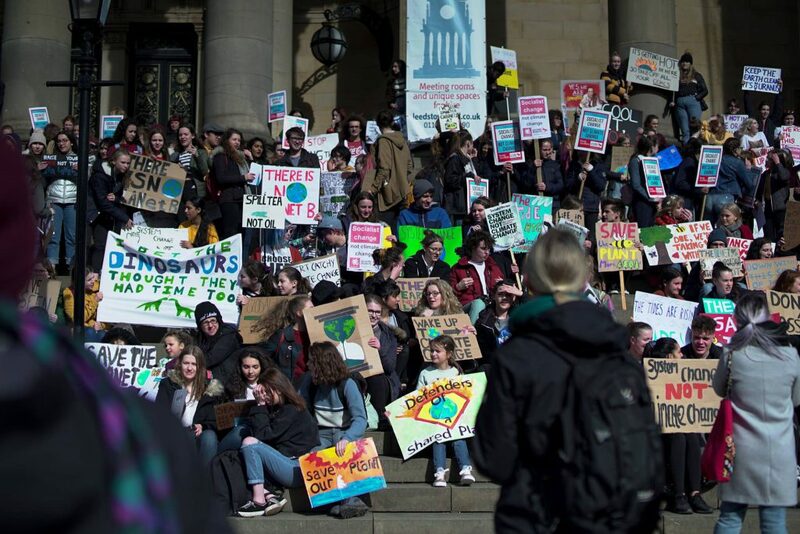 The university has revised its new policy for adverse weather conditions following consultation with trade unions. UCU, Unison and Unite were consulted on the draft policy, which all three unions agreed over-emphasised the importance of keeping the university running over the safety of staff. University senior management have made numerous changes to the policy, which now much better emphasises that staff should not risk their safety or health to get to work. This isn’t an agreed policy, but the university has made significant improvements at our request. 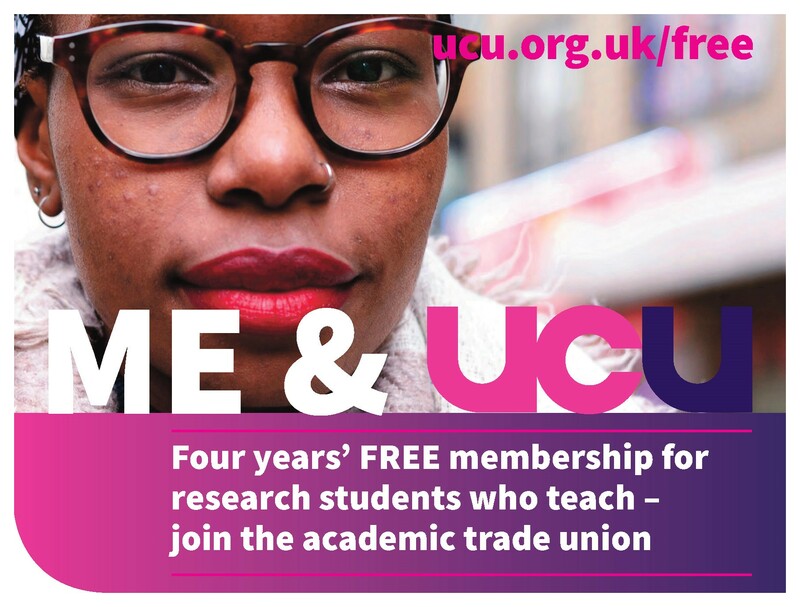 UCU’s advice, as usual, is to go into work if you can but don’t be pressured to if you can’t. Where will I find my ballot paper? What is the last date for submitting my ballot paper? I haven’t received a ballot paper. How do I request a replacement? Why can’t we vote online? I’m sure that would boost numbers significantly. Particularly upset by the large amount of paper used when it could all be online. What are we trying to achieve? What is the goal? Various issues were conflated in the strikes which again makes it difficult to know what the goal is – was this about pay – or casualization? Pensions are more important to me than pay – I’d prefer if the union would sort out our pensions first before starting another dispute about pay. Why is the union re-balloting? I’m not sure if I want to strike, should I abstain? I’m on a good grade and happy with my pay. Why should I strike? UCU seems to be against any change to working conditions whether it is reasonable (in line with common business practice) or not. We’d suggest sending it now, but, in order for it to safely arrive in time, we’d recommend sending it by Monday 18th of February. Postage is pre-paid. We have no choice – voting on paper is a legal requirement. The Trade Union Act 2016 specifically and deliberately outlawed online voting in industrial disputes, at the same time as requiring a 50% turnout. Achieving a pay rise that makes up for the real-terms loss of pay since 2009. The 2% we were offered (and which has been imposed) doesn’t even cover one year’s inflation. The employers have offered nothing at all on the first three points. The unions have been pushing for progress on these areas for years, without any meaningful progress. ‘Talks’ get nowhere without action to push the employers to make genuine improvements. It’s simple – we’re just asking for UUK to properly negotiate with us around workload, equality and casualisation, as well as pay. All of the issues are interlinked, which is why we think that the negotiations need to cover them all. We are also working at a local level – at Leeds we have submitted a gender pay claim and an anti- casualisation claim (although so far the only response we’ve had to these is to suggest some future meetings). It’s important that there is a national framework for these negotiations so that there are agreements that individual employers can’t opt out of. The HE trade unions can’t choose when different issues are discussed – there are different negotiations machineries for different issues. The pay offer had to be responded to at the time, because to do nothing would have meant accepting the first appalling offer. The pensions dispute is still going on because despite the Joint Expert Panel report largely vindicating the UCU position, the USS Board are currently doing another valuation and sounding out the HE employers again about possible changes. University managements will judge the union’s strength by our turnout and willingness to take action in the current dispute. If we don’t have a good turnout and strong Yes vote, they will feel more able to take further liberties with our pensions. Similarly what happens in the current ballot will affect the union’s ability to influence any and all future problems. Last October Leeds members voted clearly (70%) to strike on this dispute, with a turnout of 49%. It was the highest national turnout on a pay ballot in UCU’s history. However, the new anti-trade union law imposed a requirement for a 50% turnout before industrial action can be taken. We were just short of that, so we were prevented from striking despite a strong yes vote. 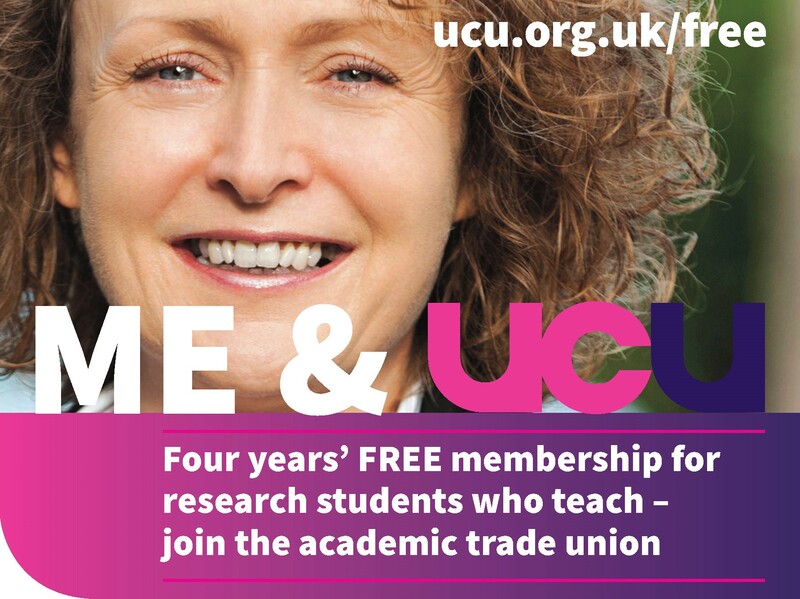 We think UCU members should decide, not the government. We’re re-balloting to exceed the 50% legal threshold so your decision counts. If you don’t vote, you are effectively voting to stop the rest of membership from being able to take action, because of the 50% turnout rule. Union democracy is vitally important, we need to know what the whole membership thinks, so please do use your vote. If you don’t think we should strike, vote No to industrial action (but perhaps Yes to action short of a strike?). Abstaining is not sitting on the fence. 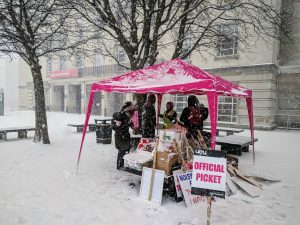 It undermines the strength of the union across the board, not only on pay, equality and casualization, but also on pensions, and in the many local issues, disputes and negotiations on which UCU works for its members. If you are concerned that you can’t afford to lose pay by striking, remember that the union has hardship funds, both nationally and locally, which can provide some financial help. Also, and most importantly, remember that the higher the turnout and the higher the Yes vote in this dispute, the more worried the employers will be about a possible strike, and the more likely they will be to come up with a better offer. Paradoxically, the stronger the vote the less likely we are to actually end up on strike! This dispute is not about the pay spine figures alone, though it is clear that pay in higher education has been eroded, and that there is money in the sector to afford a decent pay rise (compare it to what we have been given, which is equivalent to a cut in real terms). There are four, interconnected aspects which affect most people working in higher education: casualisation, equal pay (pay gaps), and workload alongside the rate of pay itself. Remember that colleagues on casualised contracts supported the USS pension strike even though many didn’t qualify for the pension! Many colleagues are given restrictive contracts on a fractional basis which makes it difficult to find work elsewhere – for example, someone on a 0.2 FTE contract who is timetabled to work those hours stretched across a four-day week will struggle to combine those hours with another job (or jobs) to make ends meet. It’s imperative to remember that a strong vote will show a strong will to act for the collective benefit of all our members, and affects our overall strength as a union. We actually hope we won’t need to strike, but knowing that we are ready to strike and take action short of a strike in defence of pay and conditions gives our negotiators a much stronger hand. If we do not beat the 50% turnout threshold with a strong yes vote, our employers’ representative body will pretend that it can ignore our concerns, despite the enormous levels of dissatisfaction, stress, and precarious work in the sector. This is also about collective strength, solidarity, and bargaining power. We must not allow employers to feel emboldened about pushing through other deleterious changes while hiding behind the turnout threshold as an excuse to silence us. We urge you to vote “yes, yes” and above all, to vote. Firstly, we’re not a business – we’re an educational institution. Usual business rules often don’t work in a university environment. 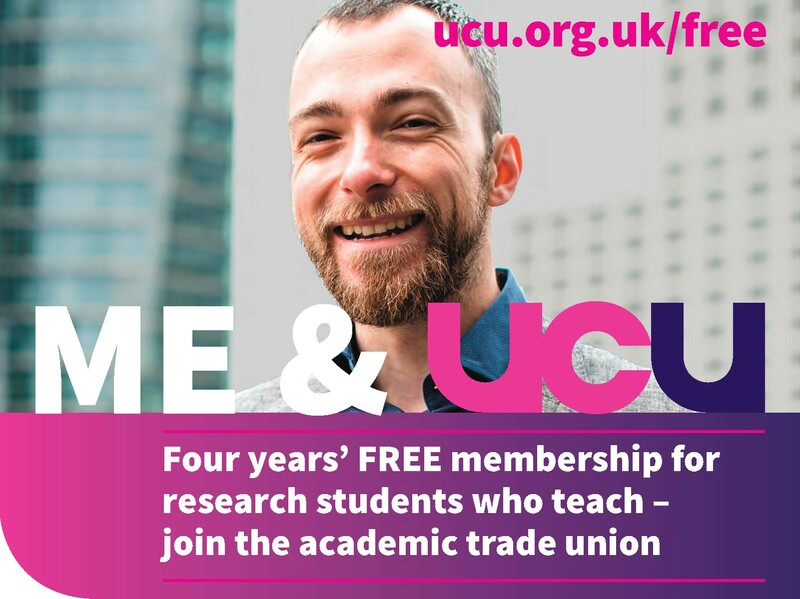 UCU negotiates with management both locally and nationally about the pay and conditions of all our members. We work on your behalf to get the best possible terms and conditions. In the past at Leeds we have been able to negotiate good agreements with management, through genuine consultation and discussion. More recently, there has been a tendency to replace negotiation with last minute information about changes followed by imposition. And agreed processes are sometimes not followed. This is not constructive and leads to all sorts of problems and issues, plus a lot of individual casework when particular staff are affected. The changes in IT at Leeds are a case in point.